This evening I walked the dog in the dusk and trailed home to read Felix a story. We have finished our beloved Cressida Cowell, with her fabulous stories of the Viking sagas written in anarchic beautifully crafted English, for seven year old boys. I mourn the passing of those wonderful books. I was captivated by the little boy called Hiccup, a most unlikely hero, who in a world where being brutish to dragons was de rigeur, became the first dragon whisperer. But they are finished, and we cannot find a hero to take Hiccup’s place. So we have moved to Horrible Histories, the set of history books with attitude by Terry Deary. While they are lary and make a point of being badly behaved, they do teach a form of history, and they appeal to my son. We have been marauding through the world of the Tudors, and tonight were touching on Queen Elizabeth I. We talked about her general bad manners towards subjects she disliked, including poor Essex, the man she may have loved. And presently, we arrived at her deathbed, and I was felled with a single blow. My husband the historian tells it so well. Elizabeth made it, just, into the 17th century. She died on March 24, 1603. It seems, looking down the dark corridors of time from the 21st century, that those who surrounded her bed were not concerned with her welfare. The life-long game she had played with her court and her people, that game where her very subjects were her metaphorical children: that had backfired on her. Because now, there was no heir to the Tudor dynasty, and the raptors round the bed were after one thing: a name. Who would succeed her? This woman devoured life. She had come close to losing it, and learnt how precious it was, very early on in her life. Phil and I potter round London for fun, on the rare occasions we do not have the children. We just drift from ancient monument to modern wonder, across new bridges and old, picking up clues that sit at the side of the street, as to the past lives of this city of many personalities. We have found you can track the River Fleet around the city, even though it is invisible and flows beneath our feet so much of the time. We have hung around Lincoln’s Inn, trying to envisage the nest of lawyers which once jostled its walls. 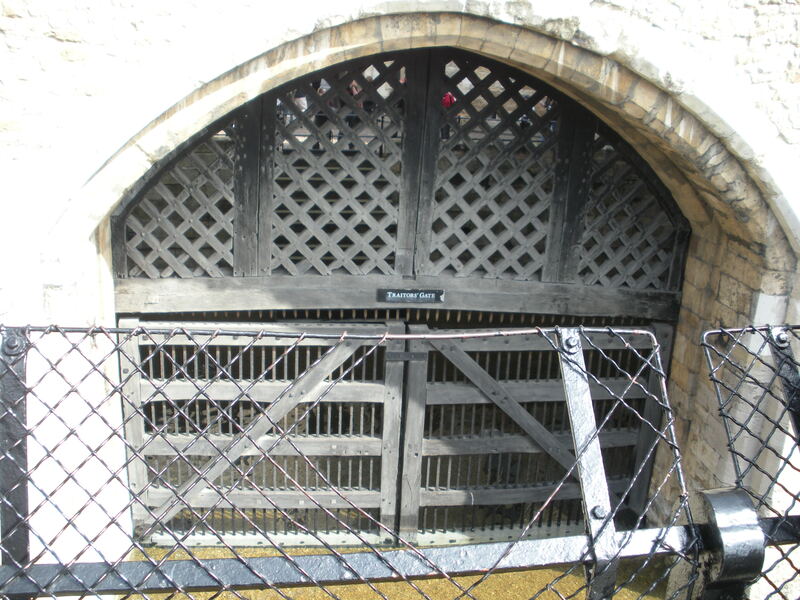 It’s not very secret, Traitor’s Gate. It no longer abuts the great river as it used to. Often when I see it, it is bathed in sunlight and surrounded by enthusiastic Japanese tourists, alongside me, all of us Recording The Moment. The tower, these days, seems smaller than it used to, beside some of the buildings of the city: not least Tower Bridge, which rises and falls with ponderous Victorian theatre nearby. But when Elizabeth was brought up the Thames to Traitor’s Gate, she must have thought her number was up. She must have had to acknowledge there was a possibility she may never come out of that tower again. I did that once. I looked at the moon, a crisp three-quarters Winter orb, and wondered if I would see its like again. It does add something to life afterwards. When I woke and all was well, I met my relatives again and their embraces were laced with a new piquancy. Life has become very precious. This queen, born and dead hundreds of years ago, must never have lost that avarice for life, that greedy need for every touch, every smell, every sight each day brings. The last few weeks have been hard. The days have grown darker and busier and more demanding. I have listened to wonderful friends battle to keep me cheerful in the face of growing gloom. And tonight, I looked up as I walked the dog, and what should I see? A perfect, crisp moon. And I remember a covenant I made with myself not two years ago, when I thought I might not see another moon again. Each moment, Fair Oriana said, is worth all the possessions of a great queen. So, after a moment of silence for this tempestuous extraordinary woman, dead these 407 years, I am suddenly filled with resolve. There are moments we would not re-live. But most of our lives are filled with moments we pass by, like ships in the night. I shall be pausing a lot more from now on. I shall stop to greet those moments that queen valued so highly so long ago. Granted, that was quite a break for Queen Elizabeth I. She would have been thrilled I have no doubt. I love reading this, but there is an underlying worry that I picked up and (being a recent fan of your blog) I don’t quite understand. I’m wondering along with Cindy, and sending strong vibes to get you past whatever we are picking up in these posts. Be well, be happy, stay strong. Thank you both so much for your concern….I am fine:-) My Summer posts reflect being able to stay with the children all the time, and just get on with running the family: and of course the carefree Summer hols. The Autumn Me arrives every year with the same mindset., but she does leave again, I never notice her slip away. Less than two years ago, an op went wrong and thanks to our amazing National Health Service I survived. I went through all the motions of preparing to leave everyone, though. It’s easy to forget what I almost lost, and those words of Queen Elizabeth reminded me. Erk. Better have a funny one tomorrow. I’ll freak my friend Wendy out!!!! Wow Kate, I have goose-bumps running up and down my arms. How exquisitely told, touching on so important a message to enjoy each moment. It’s great to hear that you’re well now! There’s something immensely powerful behind appreciation though. My husband has brought this to my mind many times over, with his penchant for extreme sport. Never a day to be taken for granted. Thank you for the reminder. BTW, a dragon whisperer – that’s my idea of a perfect fairy tale. Avatar had me falling in love with dragons all over again, after reading Anne McCaffrey’s stories years ago! They are just brilliant books. I used to find excuses to read out loud to Maddie and Felix whenever I could to find out what happened next. But I’ve not come across Anne Mcaffrey’s books- I must check them out! I add my thanks to the NHS for seeing that you stayed with us. Thanks for your thanks. Its a great big unwieldy organisation but when the chips were down, its members moved heaven ad earth to get me through.